News :: Major League Baseball Teams Continue to Keep the Spirit of ’45 Alive! Once again, America’s Major League Baseball teams came out in support of National Spirit of ’45 Day and are planning observances this year. Last year, all 15 teams that played on August 14, announced Spirit of ’45 Day during their games, and this year a total of 19 teams are participating. This year Spirit of ’45 helped raise public awareness about the important role that professional basaeball played during WWII. The entire nation supported the war effort, both in the battlefield and the home front. Tensions were high. At the urging of President Roosevelt, the baseball clubs continued to play ball to keep morale up and maintainfeeling of community. Thousands of professional baseball players put down their bats and gloves and went off to serve their country. These included established stars like Cleveland Indians pitching great Bob Feller who put his career on hold and joined the Navy the day after the attack on Pearl Harbor. It was during this time that the All American Girls Baseball League was organized and women began to play an important part in basebaWe pleased to have the support of the All-American Girls Professional Baseball League Association (AAGPBLA) who promoted public awareness about Spirit of ’45 on their web site. AAGPBL, Spirit of ’45, Doyle, Jochum, Kurys We look forward to developing this partnership in future years to remind people of the important role the American Women’s League played in keeping our country’s spirits up during WWII. 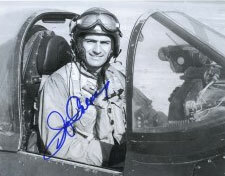 Jerry Coleman flew 120 missions and earning two Distinguished Flying Crosses as a Marine pilot during WWII and the Korean War, making him the only MLB player to have served in combat in both wars. Despite sacrificing 5 years of his career to serve his country, Jerry was MVP of the 1950 World Series, playing second baseman for the New York Yankee team that included fellow WWII vet Yogi Berra, Mickey Mantle and other greats. The San Diego Padres produced a video narrated by Jerry Coleman, our national spokesman, that was distributed to all the clubs so that they could show it up on their jumbo screens. 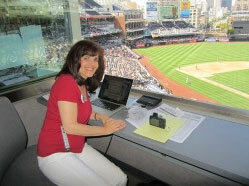 Jerry, the “Voice of the Padres” has been a real champion for Spirit of ’45, joining Edith Shain on the USS Midway in to kick off the 2010 national campaign, and representing the Spirit of ’45 in the 2010 Nation’s Veterans Day Parade in New York City. The Los Angeles Angels led the way this year with a beautiful afternoon game at Angels Stadium on August 3, where 100 WWII veterans attended as their guests. On August 10th the Minnesota Twins and the Tampa Bay Raysboth held pre-game Spirit of ’45 Day ceremonies and honored the members of the “Greatest Generation” in their communities. The Twins received special recognition from the Minnesota Historical Society for their ongoing efforts to promote public awareness and participation in National Spirit of ’45 Day. On hand to present the Twins management with a Spirit of ’45 National Leaders Award were members of the Stanley and Juanita Harris Family from St. Paul, MN. Stan Harris was a highly decorated member of the legendary Tuskegee Airmen during WWII. On Sunday, August 14, 12 more clubs have plans to have Spirit of ’45 Day observances. Most will be playing the video that was prepared for the clubs by the Padres which thanks the greatest generation and acknowledges the role professional baseball played during WWII and the thousands of ballplayers who served. Some of the clubs will be interviewing WWII veterans during their games. The Atlanta Braves (1:35 PM), theBaltimore Orioles (1:35 PM), theCleveland Indians (1:05 PM), theFlorida Marlins (1:10 PM) , the L.A. Dodgers (1:10 PM), the Milwaukee Brewers (1:10 PM), the Philadelphia Phillies (1:15 PM), the St. Louis Cardinals (1:15 PM), the Cincinnati Reds (1:10 PM), the Seattle Mariners(1:10 PM, and the Phoenix Diamondbacks (4:10 PM). Some teams are on the road on August 14th so they will be observing Spirit of ’45 Day on Monday, August 15th. The San Diego Padres will be having a “Spirit of ’45 Night” with a pre-game ceremony during which they will acknowledge 200 WWII veterans who they have invited to their 7:05 PM game. The Detroit Tigers will have their Spirit showing during their 7:05 pm game (famous Tiger Hank Greenberg re-enlisted to join the armed forces in WWII). “We owe all of these men and women a debt of gratitude for continuing to provide America with a continuing sense of shared history and community,” said Linda.